Pulling a nanowire from its substrate. Until recently, nanoscale devices could only be crafted through chemical reactions or by pushing components together on a smooth surface. Researchers at the Technical University of Denmark have developed and demonstrated practical tools allowing the precise manipulation and assembly of complex, three-dimensional nanomachines. Nanotechnology has been advancing steadily ever since the arrival of microscopes capable of imaging structures on the atomic scale. Once limited to taking still pictures, modern scanning electron microscopes (SEM) now provide real-time video and can even be used to weld two components together. Other techniques, such as scanning probe microscopy, are frequently used to push nanoscale structures together on a smooth surface. The construction of two-dimensional devices is therefore possible, but extending nanomachines into the third dimension has been a much more difficult prospect. A sequence of images showing the grippers in action. (a) approaching the wire, (b) opening the grippers, (c) clamping the wire, (d) sideways (shear) pull to disconnect, (e) separation of the wire from its substrate, (f) moving away from the substrate. Complex, three-dimensional structures have been successfully assembled in solution, by coating each component with a chemically active substance that encourages it to bond with the right partner. This technique is not ideal, however, because adding extra chemicals may change the mechanical or electrical properties of the structure. In many cases it would be vastly preferable to build a new machine by picking up and placing individual components one by one, in exactly the order desired. The Technical University of Denmark’s Department of Micro and Nanotechnology has dedicated itself to perfecting such ‘pick-and-place’ technology. While a considerable amount of research has already been devoted to the design of micrometer-sized tools, some of which are even commercially available, practical demonstrations of three-dimensional assembly are suspiciously absent. Professors Kristian Mølhave and Peter Bøggild, in conjunction with the department’s Nanointegration research group, have been working on this problem. Not only have they designed several new nanoscale tools, but they have also modeled their mechanical properties and demonstrated them in action. The first figure shows one of their simpler designs, a ‘gripper’ that can be opened and closed by placing a small amount of static charge on the prongs. The force of its grip is only about a millionth of a Newton, but this is more than sufficient to overcome the natural adhesion of a nanowire to the surface it lies on. Prior to this work, common wisdom held that nanoscale components would be just as likely to stick to the tools as to each other. “Most people thought it would not work at all, because of the strongly adhesive capillary and Van der Waals forces on the nanoscale”, Dr. Mølhave explains. “That’s exactly the kind of thing that made me want to try to do it.” His results speak for themselves. 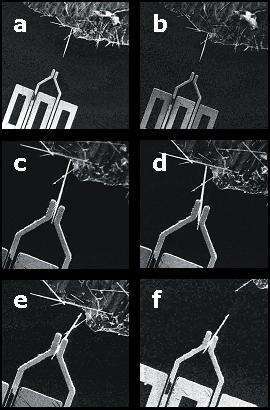 As the sequence of images in the second figure shows, adhesion to the tool is a problem that can be overcome. A more advanced gripper prototype. The triple shafts both stabilize the structure and provide multiple points of control. The gripper can be opened and closed by placing electrostatic charge on a shaft, heating a shaft with a current, or a combination of the two approaches. The tools coming out of Bøggild’s laboratory have continued to advance. Not only can they be fabricated en masse, but newer versions of the gripper have several activation modes. This allows a greater control over the applied force, as well as providing a channel for feedback to the tool’s operator. The grippers are also surprisingly easy to use! In high school demonstrations of the apparatus, students are picking and placing nanowires within an hour or two of being shown the equipment. Mølhave’s enthusiasm for these developments is clear. “We have just taken the first steps from ‘poking around with a stick’ to having ‘Tools’ with more degrees of freedom and complexity,” he claims, going on to specify that a functional nanoscale workshop should really have a variety of equipment. Just as we have several kinds of screws and screwdrivers, nanoengineers of the future will want a variety of structural elements and specialized tools to manipulate each one. Robot actuators that can hold the tools and guide them with nanometer precision are already commercially available. A fully functional workshop would allow scientists to design and assemble working prototypes of complex machines, as well as measure the properties of individual components much more easily and accurately. Mølhave speculates that this achievement is only a year or two away. Then his real work can begin, for the creation of prototypes is clearly not enough. “Once we have this nano-workshop up and running,” Mølhave says, “we will be able to work towards the automation of assembly processes.” If he and his colleagues continue working at their present pace, the mass production of nanomachines may be closer than we think! Kristian Mølhave, Thomas Wich, Axel Kortschack, & Peter Bøggild, “Pick-and-place nanomanipulation using microfabricated grippers”, Nanotechnology (2006) v. 17, pp. 2434-2441. This article is available online at http://www.iop.org/EJ/abstract/0957-4484/17/10/002. K. Mølhave and O. Hansen, “Electro-thermally actuated microgrippers with integrated force feedback”, Journal of Micromechanics and Microengineering (2005) v. 15, pp. 1265–1270. Ben Mathiesen is a research astrophysicist and owner of the agency Physical Science Editing, which helps scientists and engineers around the world achieve native English writing standards in their publications.